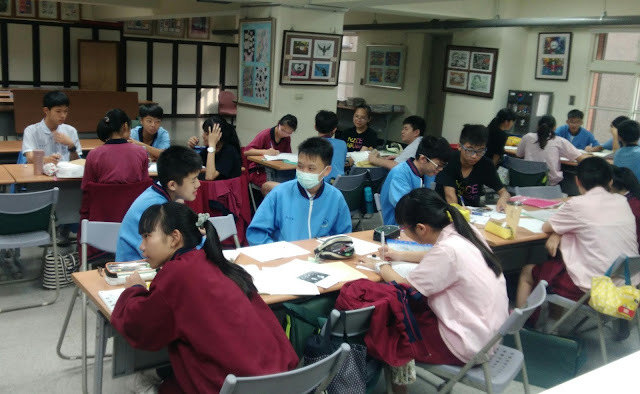 So, how does an EFL teacher draw the attention of students in Taiwan where workers' unions are as foreign as English itself? 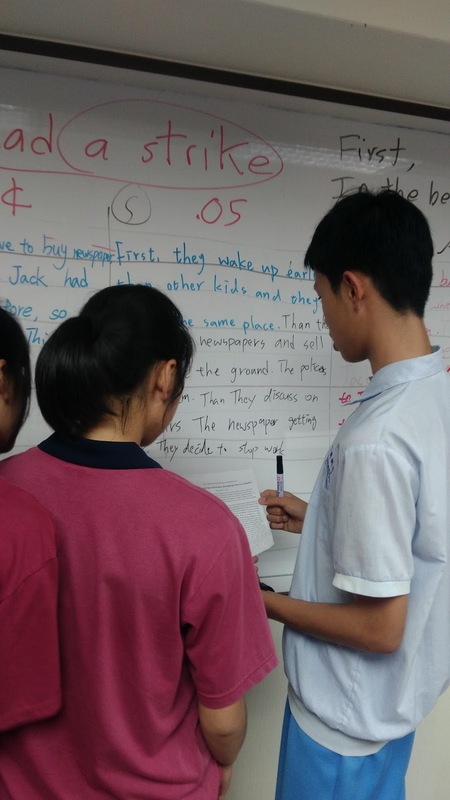 How can we help students in Taiwan achieve their dreams in a harsh and changing workplace? On April 19, 2018, I rode to Shengang Middle School where I conduct conversation enrichment. With the 8th graders, we've been discussing child abuse and oppressive child labor. 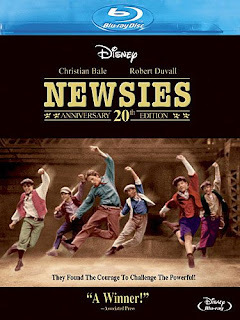 The week before, an introduction to Kid Blink and the Newsies was distributed and then we saw the first part of the Disney musical film, "Newsies." The Disney Company is not famous for labor agitation; indeed, they have been at the heart of anti-labor clampdown since Walter himself testified in the McCarthy witch hunts against communists in Hollywood in the '50's; communist being a code word for unionism. But profit is profit and they couldn't let the market that made the anti-child abuse musicals "Oliver," "Annie," and "American Tail" slip through their hands. The film is an entry-level introduction to activism for Taiwanese middle-school students with intermediate EFL skills. Children of families in Taiwan that suffer from underpay and overwork in a union-less work force with a declining standard of living, so much that the birth rate has dropped significantly, need to know this. Foreign teachers must take the lead in helping Taiwanese students establish a culture of unionism. On March 15, 2018, 107 years after the tragic workplace fire, the 8th grade class wrote and presented summaries about oppressive child labor from an excerpt of Fire at the Triangle Factory. We then read “Joseph Miliauskas: Breaker Boy” from We Were There, Too; Young People in U.S. History. Earlier, they had done a multiple choice on oppressive child labor discussing scenarios through reported speech question and answers. I told the children we would see a movie about such exploited children. They were thrilled to hear that; children love movies. I had tweaked their interest. 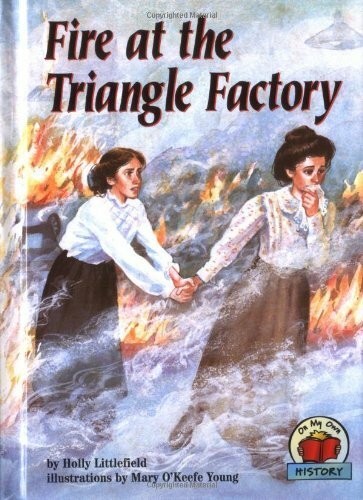 I handed my assistant the DVD so I could show the trailer and get the kinks out but I was not going to show the film until every child showed their homework; a short introduction about Fire at the Triangle Factoryor “Kid Blink and the Newsies: Bringing Down Goliaths”. After sharing aloud, we begin to watch the Disney musical, Part 1. The children were asked to note actions of the main character, English or Chinese was okay. The class then caucused in groups of 4-5 to write two actions each (present tense) about the film segment. They begin sentences with a list of time phrases I put on the board (First, Next, Finally) and in cooperative learning, order the actions, choosing five to write on their team space on the board. I took photos of each board and combined the groups findings (see brainstorm list below) then handed out the list the following week for them to put in order removing redundant and irrelevant sentences. Once that was done, I continued showing the film and the group work process. I played Part 2 for them yesterday after they began to organize the 37 details they had amassed from part one. Each group brainstormed two more details for the continuing lesson to conclude two weeks from now. 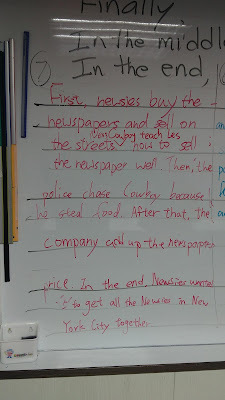 At the end of class, the students made compound sentences with "after" and "before" as I showed them how to eliminate the excess pronoun after initial proper noun. 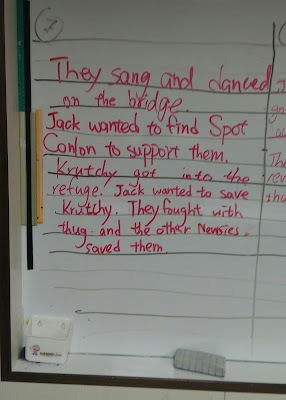 They wrote two examples on the board. The silence came when I showed how, with commas, they could go on forever adding to time order details without repeating the subject pronoun. It must have been a revelation to them. I never heard them so quietly listening. ___An old man calls all the boys to get up. ___They sing, dress, and go to the sidewalk. ___The Newsies feel the extra profit their bosses take is not good for them. ___The Newsies decide to strike. ___The boys buy newspapers and sell them. ___Newsies have to buy newspapers. ___Newsies sell newspapers to people. ___Jack, Dave, and Les run into a theater. ___They watch a singer in the theater. ___The newspaper bosses want to make more money from the Newsies. ___They live in the same place. ___They take some newspapers and sell them. ___They sit on the steps. ___Newsies discuss how their newspaper sale profit is getting lower. ___They decide to stop working. ___Newsies buy newspapers to sell. ___They run into a theater to see a friend of Jack’s father. ___They go to Jack’s house to meet his family. ___The Newsies go on strike. 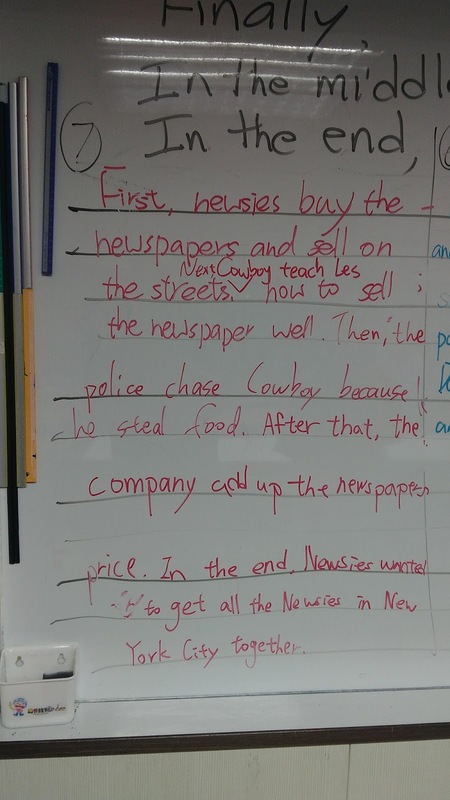 ___Cowboy teaches Les how to sell newspapers well. ___The company increases the price of newspapers. ___Newsies want to get all the Newsies in New York City together. ___There are many boys that sell newspapers in New York City. ___Jack meets two boys, David and his brother, Les, on the street. ___Jack sees a detective so he runs into a theater. ___David and his family celebrate his dad’s birthday. ___The Newsies sell newspapers to make a living. ___Suddenly, the newspaper’s price gets higher. For labor solidarity, "Newsies" is the most important film Disney ever released. The film is a pathway into the notion of what a union is; great to show to middle and high school students in Taiwan, most useful because it sneaks up on them and has them on the side of the newspaper boy strikers before they realize they have aligned themselves correctly with class interests designed to raise their social “workers” consciousness while welcoming them to the world of the English. Even at a low-intermediate level of proficiency, this can be done with the use of kinetic activities (contests, cooperative learning, arts and crafts, etc.) and through the media of song and film: a musical named "Newsies."